During the month of February, there’s a lot of talk about love and hearts, roses and candy, kisses and hugs. And while you probably already know our stance on those little candy hearts and boxes of chocolate (easy on the sweets! ), you may be surprised to learn that at the Lewisburg dental office of Dr. Larry Winans, we also have some thoughts on how kissing can affect your oral health. That’s right, a lesson on the pros and cons of kissing from your Lewisburg dentist. When you think about it, it makes a lot of sense to take kissing advice from a dentist. After all, we know all about your mouth. Let’s start with a positive of puckering up. Kissing is, in fact, good for your teeth. The act of kissing increases saliva production, and saliva helps to remove plaque and wash it away. So next time you’re smooching, remember that it can be beneficial not only for showing your love, but also for your teeth! While an increase in saliva production is good for your mouth, there are a bunch of other reasons kissing may not be so good for the health of your smile. We all know that kissing can spread colds, but did you know that kissing can also spread gum disease? Research has shown that when you lock lips, it’s just as easy to catch gum disease as it is to catch a cold. If your loved one has active gum disease, you should be aware that it is possible to transfer this major dental danger. The main lesson in kissing? It can be good for you and your health, but it’s very important to maintain your regular cleanings and checkups to make sure your mouth is in tip-top kissing shape and to avoid passing gum disease to others. Overdue on your professional cleaning or dental checkup in Lewisburg? Give Dr. Larry Winans a call today! 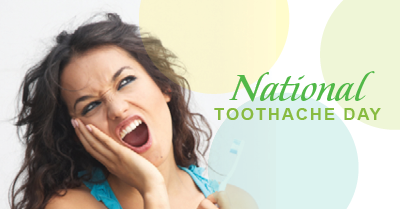 February 9th is what has become known as National Toothache Day. And while we aren’t sure of the origin of this holiday, it’s definitely one we stand behind. Lewisburg dentist, Dr. Larry Winans, wants all of his patients to see this day as a celebration of good oral health and a toothache-free mouth. Nobody enjoys toothaches. And we definitely don’t want you to experience the pain and unpleasantness associated with them. In fact, toothaches can be avoided with a thorough at home oral care routine and by maintaining professional checkups and cleanings at your Lewisburg dental office. Not only can following these tips keep toothaches away, they can also help keep your overall mouth healthy and are great for preventing gum disease, tooth loss, and cavities. If you’re experiencing a toothache in Lewisburg, call Dr. Larry Winans today. We’ll evaluate your pain and get you back on track for a healthy smile. If you’re due for a checkup, don’t wait to visit us. Being proactive in your dental care is a great first step to staying toothache-free.